Handguard, forend, forearm, foregrip— whichever name you use for it, picking out this essential part for your AR-15 is vital to your rifle’s (or pistol’s) functionality. 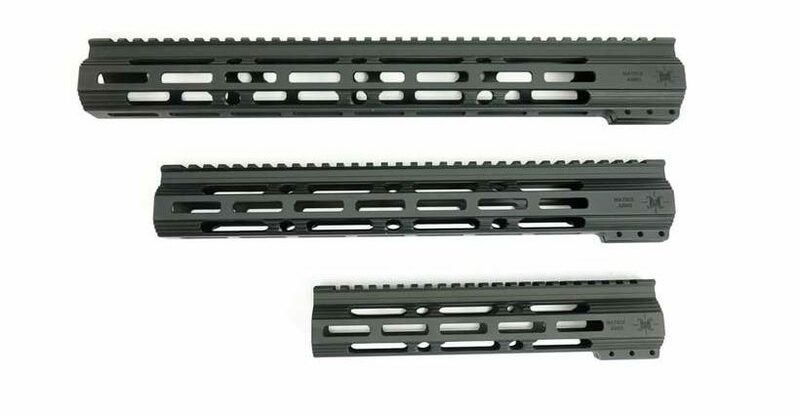 The type of AR-15 you are building is important, so choosing the correct type of handguard for your type of AR build makes a big difference. It can also change the appearance of your firearm quite a bit. The main function of a handguard is to protect the shooter’s hand from the heat of the barrel while operating the firearm. In addition, accessories can be installed onto handguards to aid your shooting, such as angled back up iron sights, lights, lasers, and various forward grips. Take some time and browse through this handy list to get an idea of which type of handguard will best suit your AR-15 build. The two main materials used for handguards are aluminum and polymer. While both are quite durable, aluminum is usually going to be stronger. However, it can also emit more heat than a polymer guard after an extended shooting session. Polymer handguards usually employ a heat sheild made of steel or aluminum that separates the polymer forend from the barrel. There are also polymer forends that have a steel or aluminum framework. But basically, Aluminum and Polymer are the two prominent forend construction materials. Although multiple design variations exist, the main handguard design categories in today’s market are drop-in handguards which would be something like the MAGPUL MOE handguards and one-piece free float type handguards like the Dirty Bird 10″ Free Float Quad Rail Handguard. Let’s take a look at the advantages and disadvantages of each type of handguard. Drop-in handguards are the most common type of handguard, they’re generally pretty easy to install, and most of them are made of lightweight polymer. They usually consist of two pieces that fit around the barrel. They are fastened together by a Handguard Cap towards the front of the forend, and they are secured by a Delta Ring assembly towards the rear of the forend. They take their name from how easy it is to install them and “drop” the new one into place. Its pretty easy, you just pull back on the spring-loaded Delta Ring to remove the handguard, follow the instructions for removal and install the new one using the same steps in reverse order! Even though they are available in many different lengths, you need to choose a length based on the size of your gas system. While they are often the cheapest option, drop-in handguards do have one possible disadvantage. They can sometimes affect accuracy since most of the designs incorporate a handguard cap. The handguard cap is usually in contact with the forward portion of the barrel. Accuracy can be especially affected when foregrips or bipods are used with the handguard. Not always, but it is possible. Almost all free-floating handguards are made out of aluminum instead of polymer. Although they may cost more, they have one main advantage over drop-in handguards: they do not make contact with the forward portion of the AR-15 barrel, which means you may achieve better accuracy. Free-float handguards come as one solid piece that slides around the barrel and are usually attached with some form of barrel nut. 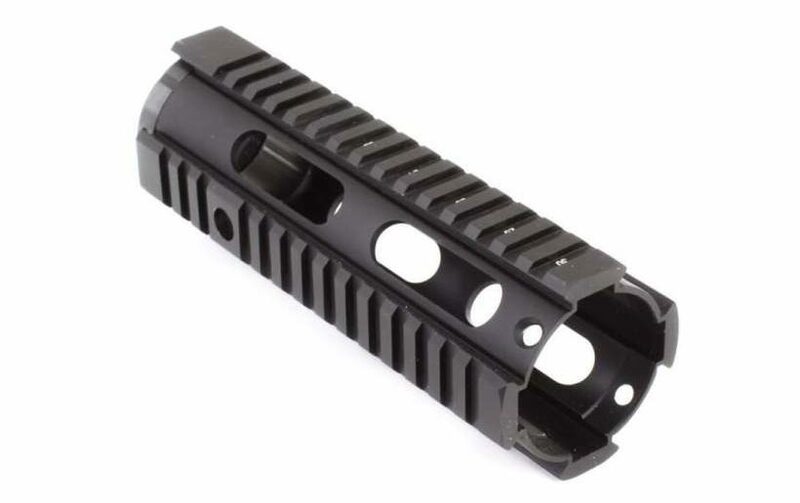 They are available with and without Picatinny Rails, some come with or without the Keymod or M-LOK System, and some come with or without QD attachment points. There are multiple options available to fit your specific build or platform. Mounting systems allow you to install various types of sights, lights, lasers, bi-pods, forward grips, and other accessories onto your AR-15. There are three popular types of mounting system: Keymod, M-LOK, and Picatinny. Most free-floating handguards use the picatinny rail system, which has traditionally been the preferred system of military and law enforcement. However, the picatinny system can be bulkier and heavier than Keymod or M-LOK. The latter two use machine cut-outs for attaching accessories, instead of the picatinny’s dovetail angles and grooves. The result is a lighter system that is just as simple to use. So you may be asking the question: Which is better, Keymod or M-LOK? Both of these modern designs have pros and cons. Read on to find out which system is right for you! The slots in the Keymod system look like keyholes—hence the name. To use, you simply place the lug in the keyhole and slide it to the narrower end to fasten your attachment securely using compressive force. It’s easy to use and isn’t nearly as bulky as the picatinny system. On the downside, you may not find as many accessories compatible with the Keymod system as you would the M-LOK, simply because some of the biggest names in the industry (such as Magpul) produce many products compatible only with M-LOK systems. Another disadvantage is that Keymod accessories generally don’t work very well with polymer handguards because of the design of the mounting system. The term “M-LOK” stands for “Modular Lock”. The Magpul company came up with this innovative way to mount accessories, and, unlike the Keymod system, it isn’t open source. Licensing is free to any manufacturer who obtains permission, but every M-LOK system must with the same quality as the original design. Instead of key holes, the system uses narrow slits and T-shaped nuts that lock into place when turned. The advantages? Accessories can be mounted to the front or rear ends of the slots, and most Magpul accessories can be used without a rail adaptor. One disadvantage, however, is that it can be slightly more difficult to properly align the attachments. Looking for a good deal? 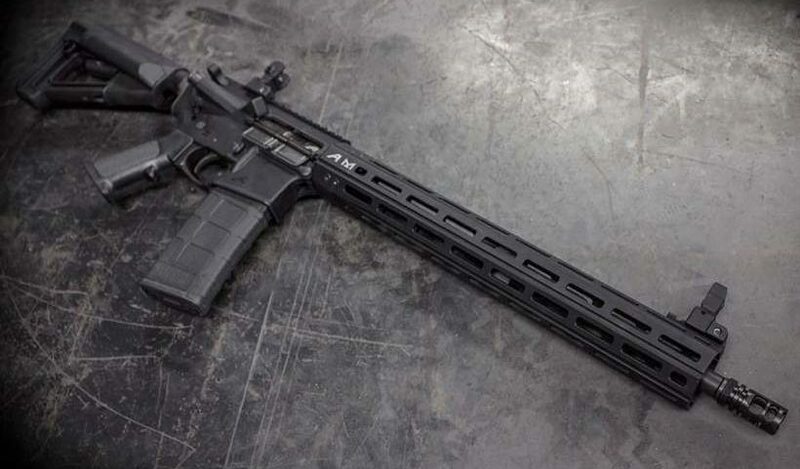 A Magpul MOE is your best bet for an affordable drop-in handguard. 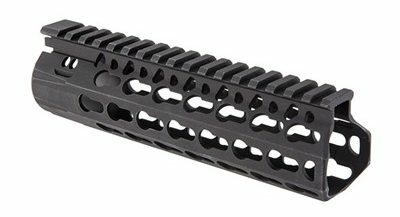 If you’re in the market for a free-float handguard, check out the pictured Tiger Rock 7″ Carbine Length Free Float Quad Rail Handguard w/ Barrel Nut. Looking for super high quality and extreme performance? Then take a look at Geissele. 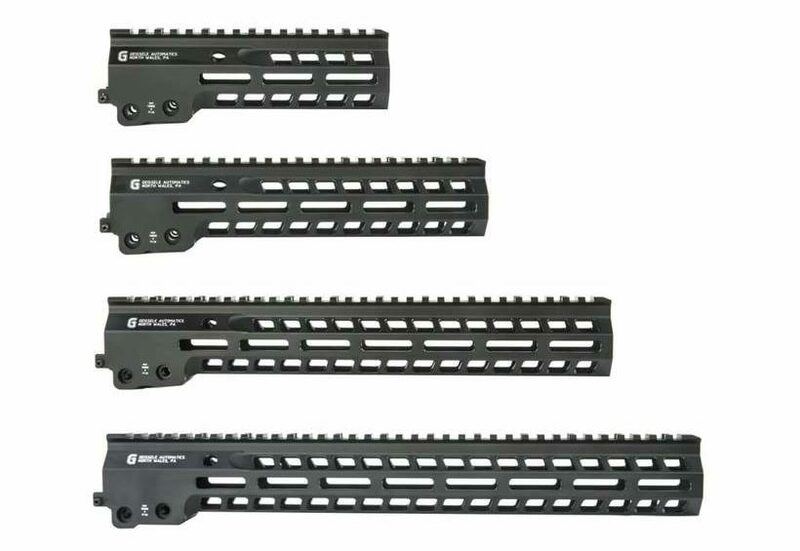 They’ve got you covered with the Geissele Super Modular Rail MK14 M-LOK Handguard. It’s available in Black or DDC (Desert Dirt Color), and the design is available in 4 sizes. Made of low-profile stainless steel, it’s one of the highest quality free-float M-LOK handguards you’ll find on the market. Looking for something in the mid-range area? 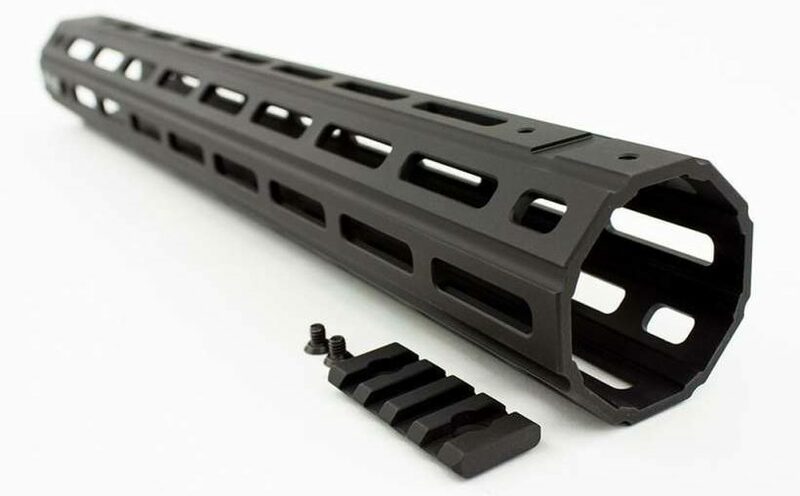 Try the best-selling Aero Precision AR15 Quantum M-LOK Handguard, which minimizes bulk by incorporating removable Picatinny Rails, and provides an adaptive one-piece free float design that is big on features. It is machined to exacting dimensions from 6061-T6 aluminum, it comes in 4 sizes, 2 colors, and features the popular MAGPUL M-LOK modular accessory system. When it comes to forends, which one you purchase is always going to be based on how the firearm is going to be used. Is it a pistol or rifle? Is it 5.56 caliber or .308 caliber? Are you running a suppressor or not? Is this firearm going to be used in competition or just for shooting at the range? All of these factors and more come in to play and should be considered during your AR build. Just remember to choose wisely, get the right handguard for the right application, and get what fits in with your personal budget.